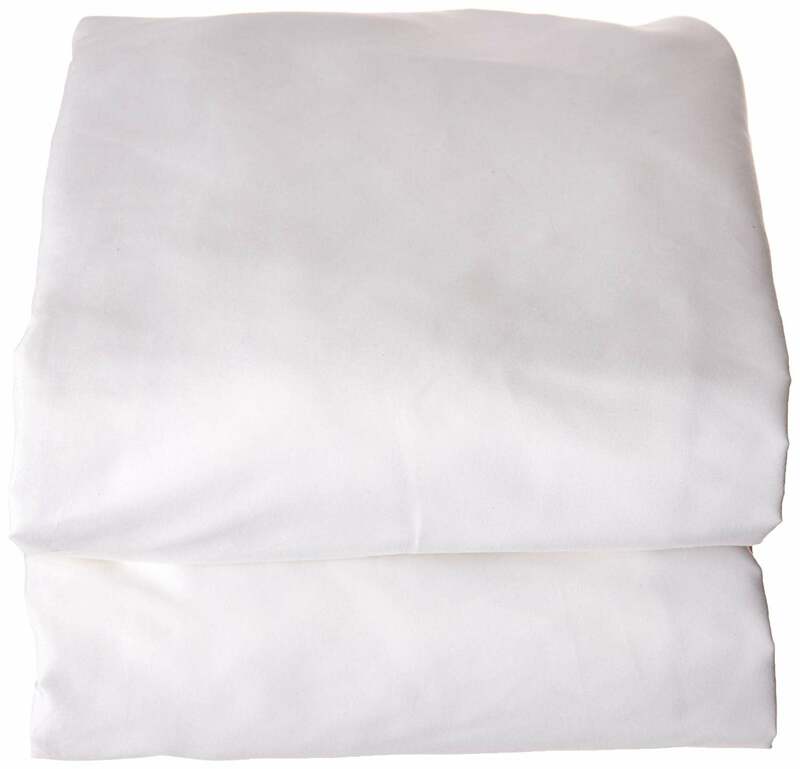 Made of Egyptian cotton fibers, these bed sheets are smooth and long-lasting. They are some of the most comfortable and affordable sheets on the market. Egyptian cotton is considered best in class when it comes to high-quality cotton and these sheets are no exception. Bonus: these sheets feature a sateen fabric for a satin-like finish. Some bed sheet reviews warned about the potential for pilling. Wash these sheets before use because they may be a little stiff and scratchy out of the packaging. These fitted sheets are made from mercerized fabric for longevity and are pre-shrunk for shape retention. If you want a comfortable sheet set at an affordable price, we highly recommend this option. This product is Oeko-Tex standard 100 compliant, meaning it’s 100% free from harmful substances. The stitching is also great quality and all exposed fabric edges are nicely sewn together. Though it’s made with a 220 thread count (below average), it’s still a pretty comfortable option. It fits better on deeper mattresses, so it may be loose on a standard size bed. Luxury meets performance with these bed sheets. They’re stronger and more durable than cotton. They’re wrinkle- and fade-resistant too. This set is breathable and body-conforming. The sheets provide excellent ventilation and offer moisture-wicking properties. They’re not as soft as 1500 thread count Egyptian cotton should be. These are some of the more affordable bed sheets available. Made of 100% woven polyester satin, this set is smooth and silky with lustrous sheen for added style. They stay crisp after each wash and help keep your body temperature comfortable during each night’s sleep. 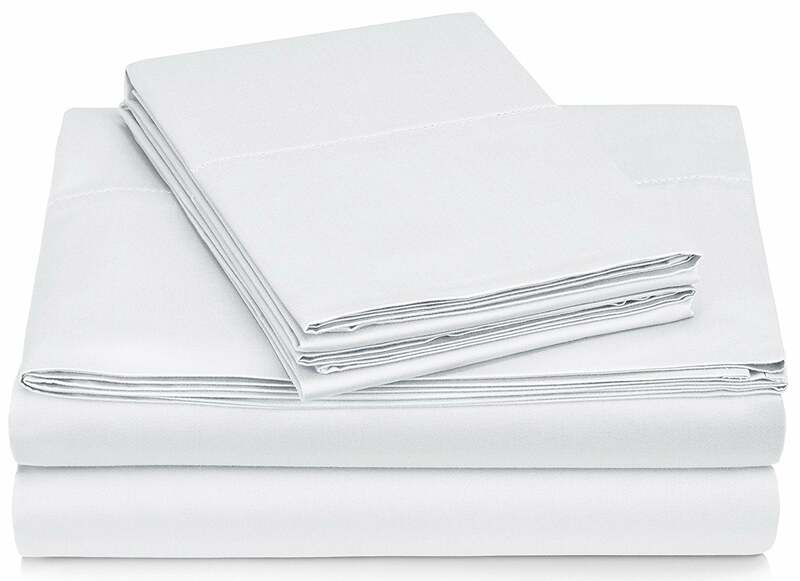 Some consumers have reported that these sheets are more slippery than soft. These microfiber sheets are designed to look great, feel comfortable, and fit perfectly on your mattress. They’re a solid option for allergy sufferers as they’re resistant to dander and dust mites. Made of the highest quality brushed microfiber, these queen bed sheets are wrinkle-, stain-, and fade-resistant. They’re also available in multiple colors. They may sleep hot and some consumers have noticed pilling over time. There’s no better feeling than jumping into bed after a long day, especially once you’ve managed to find the best sheets. At House Method, we care deeply about getting a restful night’s sleep, so we brought in a variety of bed sheet sets to test in our Research Lab. We also turned to thousands of trusted bed sheet reviews and consulted sleep experts to determine which sheet sets are the very best. We did all the work for you so you can enjoy a good night’s sleep. Whether you’re looking for a quality set of bed sheets for your guest room or just want to swap out your old, tired sheets in your bedroom, you’ve come to the right place. A good set of bed sheets is just as important as your comforter or pillow, but many don’t put in the research to find ones that are a perfect fit. That’s where House Method comes in. Our Reviews team strives to help you find the best products on the market with honest, unbiased information. Keep reading this complete bed sheet guide to determine what factors you should be considering before buying a new set, which products we highly recommend, and answers to frequently asked questions regarding bed sheets. There are a variety of bed sheet materials available, including cotton, jersey, flannel, linen, microfiber, silk, satin, bamboo, and polyester. Here’s an in-depth look at each one. Cotton—This is by far the most popular sheet material because of its natural, breathable features. The highest-quality options include Egyptian cotton, Pima cotton, and Supima cotton. Egyptian cotton is best known for its luster and luxurious softness. Though there are some cotton bed sheets that are dyed or heavily processed, there are other organic, eco-friendly options that don’t contain any dyes. Jersey—This is technically classified as a type of cotton sheet, but it’s knitted rather than woven. Jersey sheets are extremely comfy but will make you warm in bed, so we suggest going for this option if you live in a colder climate or want to stay a little warmer during the winter. Polyester—Inexpensive and wrinkle-resistant, polyester is the second most common material. Polyester sheets are known to pill more than other types of bed sheets and can be scratchy or stiff. If you’re looking for sheets that are cheaper than cotton, yet softer than polyester, consider a cotton/polyester blend. Flannel—Flannel sheets are made from a blend of different types of cotton. They have a soft, brushed surface and provide warmth during colder months. The quality of flannel sheets is measured in ounces of material per square yard (thickness) instead of thread count. Linen—This high-quality material is strong and durable, but it softens with use and can be prone to wrinkling. These are the perfect sheets for summer thanks to their breathability and moisture-wicking properties. Linen sheets have lower thread counts than other materials, so look for 200 thread counts for a suitable quality. Microfiber—Made from finely woven synthetic fibers, microfiber sheets tend to have a very soft feel and retain body heat on cold nights. The tightly-woven fabric also repels liquids and is extremely stain-resistant. Silk or satin—These sheets are loved for their luxuriousness, but they can often feel more slippery than soft. Because of their cool feel, these bed sheets are better for warm nights. Look for silk or satin sheets with a thread count of 300 for lasting durability and a more glossy appearance. Bamboo rayon—Bamboo rayon sheets are made of chemically treated bamboo materials. They help regulate your temperature while you sleep and have moisture-wicking properties that absorb moisture from your body and keep you dry and comfortable all night long. Look for bamboo sheets in thread counts of 300 or above for the best feel. Made from 100% mercerized cotton (this means that the sheets should remain colorfast and fade-resistant through multiple washing cycles), this bed sheet is definitely one of the more durable options. Since it uses a percale weave, some may find it to be as comfortable as a sateen finish. Thread count is the number of vertical and horizontal threads in one square inch of fabric and the main indicator of a sheet’s softness and strength. Though many believe that higher thread counts equal softer sheets, you can still find comfortable, high-quality sheets at a lower thread count. For a combination of comfort and quality, look for a thread count between 300 and 500. When shopping for bed sheets, you’ll likely encounter two main types of weaves: percale and sateen. Percale sheets are created through tightly weaving an equal number of horizontal and vertical yarns. They offer a cool, crisp feel, making them a perfect option for those who sleep hot. 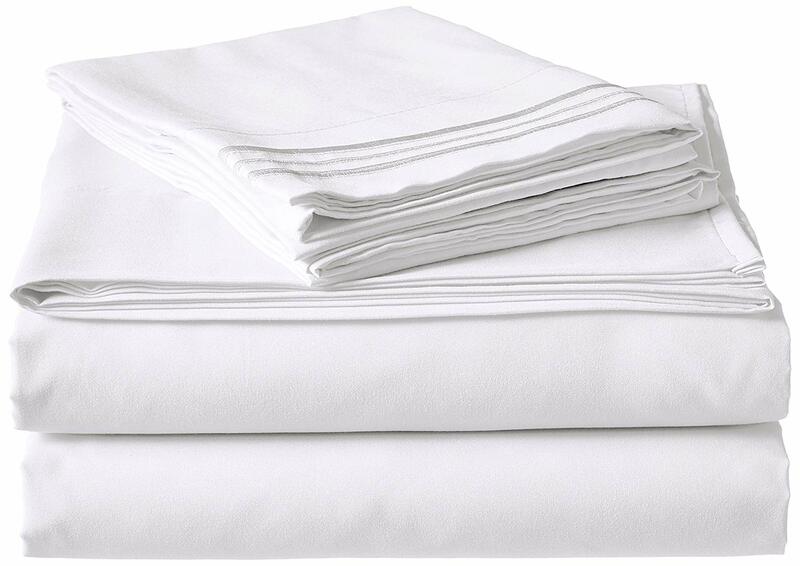 Percale sheets normally have a thread count of 180 or higher. Sateen sheets are created through a process that weaves a higher number of vertical than horizontal yarns. These sheets are often praised as being incredibly soft, smooth, shiny, and warm, though they’re not as durable as percale sheets. Standard bed sheet sizes don’t account for mattress depth, so if you have a tall mattress or use a mattress topper, make sure you measure the depth of your bed before you buy and remember to account for some sheet shrinkage after washing your sheets. Look for a fitted sheet that fits up to 15-inch mattresses—these tend to do best. You can find this information under the online product specifications. Standard-depth sheets fit mattresses that are seven to nine inches deep. Deep sheets fit mattresses that are up to 15 inches deep. Extra deep sheets fit mattresses that are between 16 and 22 inches deep. In addition to depth, measure the width and length of your mattress and match these measurements with those found under the product specifications of each bed sheet set. Bed sheets vary greatly in price, ranging from $15–$30 on the low end all the way up into the hundreds for luxury options. Price will largely depend on material, thread count, durability, brand, and other factors. The more affordable bed sheets will likely be made of synthetic fibers and have a lower thread count while the more expensive sheets will be made of high-quality fibers and have a higher thread count. Remember: expensive doesn’t always mean better. These bed sheets are made up of Egyptian cotton fibers that produce a durable and smooth fabric that will last for years to come with the proper maintenance and care. Offering smooth strength, this mid-range thread count will feel softer than a 200-thread-count bed sheet and makes a great choice for anyone looking to receive comfort at an affordable price. What’s more: these sheets have a soft, satin-like finish for all-season comfort. There isn’t a one-size-fits-all answer to finding the best bed sheets, but with these guidelines, it may make your decision slightly easier. If you want comfortable, breathable bedding, opt for cotton or polyester bed sheets with a higher thread count. If you live in a colder climate and want to stay warm, opt for flannel, microfiber, or jersey bed sheets. If you sleep hot and prefer moisture-wicking properties, opt for linen or bamboo bed sheets, or go for percale sheets. What are the best bed sheets to keep you cool? In general, linen and bamboo bed sheets are the best at keeping you cool and regulating your temperature throughout the night, but satin and silk can also keep you cool. We recommend the Royal Opulence bed sheets—they are made of 100% polyester satin and help keep your body temperature comfortable all night long. Is Egyptian cotton the best? Egyptian cotton bed sheets are made up of thin, extra long fibers that provide a softer and more durable sleeping experience. Longer fibers mean a stronger fabric and the ability to create a high thread count fabric. Pinzon by Amazon bed sheets are made of Egyptian cotton and are some of the most comfortable on the market. Is it better to have a higher thread count? Yes and no. High thread counts can certainly make for better sheets, but it’s the thread that matters most. In fact, a sheet of a better-quality fiber with a lower thread count will feel softer and stand up to washing better than a sheet of a lower-quality fiber with a higher thread count. 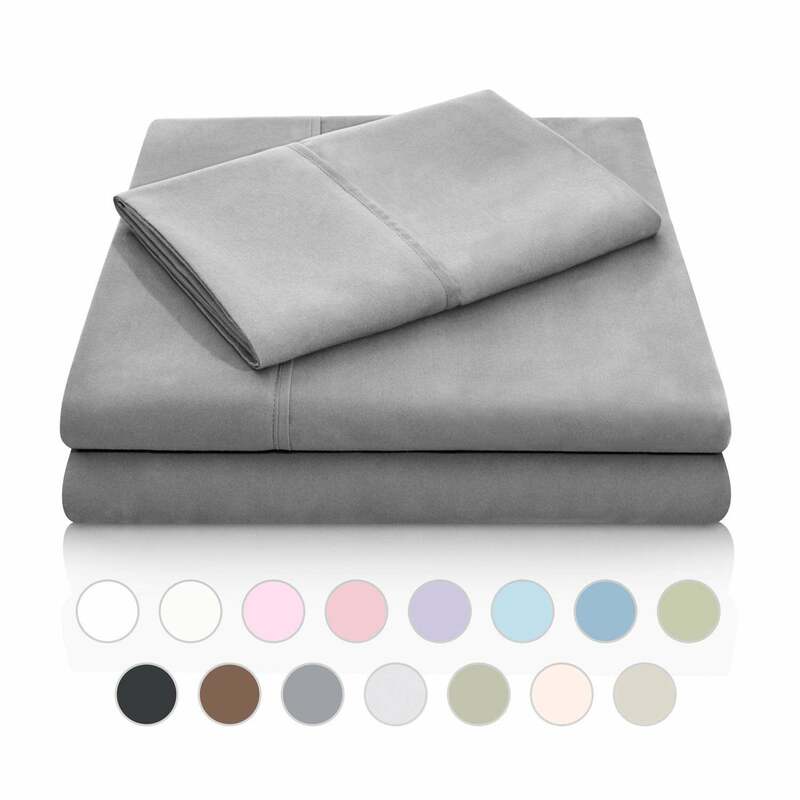 Elegant Comfort bed sheets have a 1500 thread count and are exceptionally breathable and durable, but the Pinzon bed sheets have a 400 thread count and they’re just as comfortable. Window air conditioners have improved significantly over the years and now include built-in energy efficiency features, programmable timers, and powerful fan speeds. Keep reading our comprehensive buyer's guide to find the best unit for you and your home. A home office desk can make or break a productive workday. If it’s too small, cramped, or uncomfortable, you probably won’t be as efficient with getting your work done. Keep reading our buyer's guide to home office desks and see which ones we believe are the best on the market.